So said Professor Moriarty to Sherlock Holmes on the occasion of their first meeting. 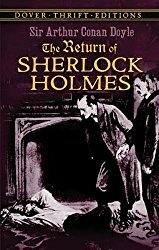 It was an incident that was to lead very shortly to the death of the professor of mathematics and to his criminal enterprise -- and to the death of the Great Detective Sherlock Holmes. At first, Dr. (later Sir) Arthur Conan Doyle had been wildly excited about his creation. 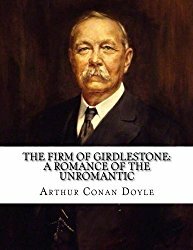 Among the works he produced during this early time was an interesting piece of fiction called The Firm of Girdlestone. Although it was not to see publication for some time, it eventually did see the light of day. Sherlockians point to it as revealing the background of the woman who was to become the landlady of Sherlock Holmes -- Mrs. Martha Hudson. Mrs. Hudson was not the central character of The Firm of Girdlestone. Indeed, she only appeared near the beginning of the novel. It seems her husband, Jim, was lost at sea. Mrs. Hudson was visiting the proprietors of the Firm of Girdlestone seeking recompense, for the Firm owned the vessel upon which Jim lost his life and Martha Hudson was left a widow. But it seems the Firm was incorporated and legally owed her nothing. And that's exactly what it paid her. Her desperation from this situation may well be the motivation that drove her to acquire a house and seek tenants. 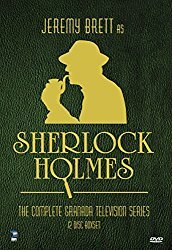 In 1887, two of Conan Doyle's works of note were published. One was "The Mystery of Uncle Jeremy's Household," very much in the manner of what would become Doyle's style for the Sherlock Holmes stories. 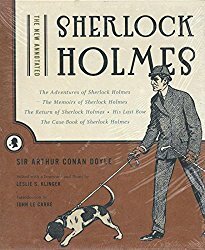 The narrator's name was John H. Thurston (a literary precursor to John H. Watson? Undoubtedly!). 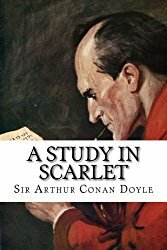 The second Doyle work to see publication that year was a novel called A Study in Scarlet -- the very first Sherlock Holmes novel. It was published in the Beeton's Christmas Annual in 1887. Doyle had had a hard time getting in published. It was first rejected a number of times and, when finally accepted, Doyle accepted a pittance -- a mere twenty-five pounds, and he lost all rights to it forever. Joseph Marshall Stoddart--managing editor of Lippincott's Magazine in Philadelphia, Pennsylvania, USA--sailed across the Atlantic to encourage two authors whom he believed in. He took the authors out for dinner and urged Doyle to write another Sherlock Holmes book. This other writer also produced a novel as an outcome from the dinner: Oscar Wilde wrote The Picture of Dorian Gray. The Sign of the Four also presented Miss Mary Morstan -- whom Holmes described as a "model client." She had some significance in the life of Dr. John H. Watson, also, for she became his wife. And so the two fellow lodgers -- Sherlock Holmes and Dr. John H. Watson -- were to go their separate ways. Then Doyle had an important idea... He would write a series of short stories -- all about the same character (Sherlock Holmes!). This was a new concept -- to keep the continuity by following the same protagonist through a series of short stories had never been done quite this way. To be sure, Edgar Allan Poe had written three stories about August Dupin, but these were not produced month after month in sequence. Doyle approached The Strand magazine. His proposal was accepted, and the rest is history. 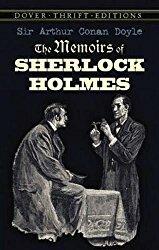 The public enthusiastically embraced reading about Sherlock Holmes every month; Doyle's efforts created a whole new market for this kind of fiction and for series' characters. 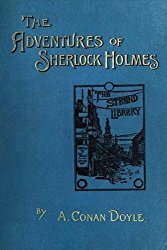 And the Holmes stories were collected into two volumes of short stories: The Adventures of Sherlock Holmes and The Memoirs of Sherlock Holmes. "Sherlock Holmes -- His Limits"
SHERLOCK HOLMES -- his limits. 1. Knowledge of Literature. - Nil. 4. " Politics. - Feeble. 5. " Botany. - Variable. Well up in belladonna, opium, and poisons generally. Knows nothing of practical gardening. 6. " Geology. - Practical, but limited. Tells at a glance different soils from each other. After walks has shown me splashes upon his trousers, and told me by their colour and consistence in what part of London he had received them. 7. " Chemistry. - Profound. 8. " Anatomy. - Accurate, but unsystematic. 9. " Sensational Literature. - Immense. He appears to know every detail of every horror perpetrated in the century. When I had got so far in my list I threw it into the fire in despair. But, of course, Watson wrote this before he got to know Holmes better. When he did so, Holmes revealed bits of knowledge and wisdom on subjects that often surprised Watson, as in his sudden and unexpected discourse on religion. 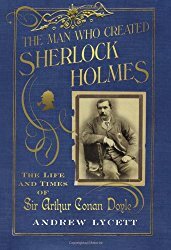 Master Detective of "The Golden Age"
But after two years of churning out Sherlock Holmes stories, Doyle declared that Holmes "...takes my mind from better things," alluding to his own spiritualistic activities and his desire to write historical novels, as well as other projects. "My nerves are fairly proof, Watson, but I must confess to a start when I saw the very man who had been so much in my thoughts standing there on my threshold. His appearance was quite familiar to me. He is extremely tall and thin, his forehead domes out in a white curve, and his two eyes are deeply sunken in this head. He is clean-shaven, pale, and ascetic-looking, retaining something of the professor in his features. His shoulders are rounded from much study, and his face protrudes forward, and is forever slowly oscillating from side to side in a curiously reptilian fashion. He peered at me with great curiosity in his puckered eyes. "The fact is that upon his entrance I had instantly recognized the extreme personal danger in which I lay. The only conceivable escape for him lay in silencing my tongue. In an instant I had slipped the revolver from the drawer into my pocket, and was covering him through the cloth. At his remark I drew the weapon out and laid it cocked upon the table. He still smiled and blinked, but there was something about his eyes which made me feel very glad that I had it there. "'I can promise you the one, but not the other,' he snarled, and so turned his rounded back upon me, and went peering and blinking out of the room. The period after the death of Sherlock Holmes, and before his resurrection, has come to be known among Sherlockians as "The Great Hiatus." Doyle was sick of writing about Holmes, but the public was still enthusiastic about reading him -- or seeing him in action in any form available. American actor William Gillette was called upon to write a Sherlock Holmes play, and was put in touch with Doyle. 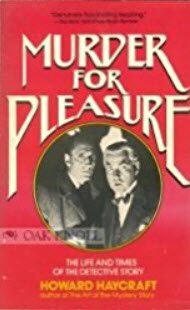 When William Gillette was considering how to approach writing a Sherlock Holmes play, he thought it well to provide a love interest for Holmes. Audiences loved romance. Gillette wired Doyle for his permission: "May I marry Holmes?" Doyle responded, "You may marry, or murder, or do what you like with him." These anecdotes demonstrate Doyle's attitude at the time toward his detective hero. But Doyle was not quite finished with Mr. Sherlock Holmes. While he was visiting a friend, he was told a local legend that he thought would make a grand mystery. Holmes, of course, was dead at this time. But Doyle realized that it would make a perfect Holmes story (after he worked through the idea of creating another detective and realizing he already had one). No, he didn't resurrect Holmes -- at least not yet. 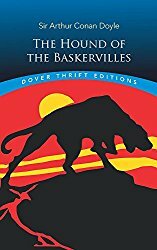 He wrote the classic The Hound of the Baskervilles as a reminiscence of Dr. John H. Watson, a previously untold episode that happened to the Great Detective while he was still alive. The Hound was published in serial form in The Strand magazine and was immensely popular. 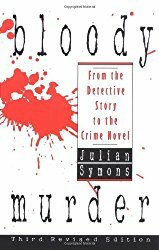 Touted by many readers and reviewers as one of the best mysteries (it appeared on at least one list as one of the four best murder mystery detective stories of all time, along with The Nine Tailors by Dorothy L. Sayers, The Lodger by Mrs. Belloc-Lowndes, and Trent's Last Case by E. C. Bentley), although John Dickson Carr believes The Valley of Fear is the best Sherlock Holmes novel. But there came a day when Doyle began to wish that Holmes were still alive, and he began to think of a way to revive him. During the hiatus there was still enormous interest from the reading public for more Sherlock Holmes stories. Doyle needed money, and writing more Sherlock Holmes stories was certain to bring it his way. 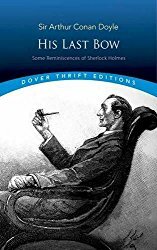 It was his mother who suggested the perfect solution, and Doyle wrote "The Adventure of the Empty House," explaining how it came to be that Sherlock Holmes -- long thought dead by the public, the police, and his friends -- was actually still alive. So Sherlock Holmes was resurrected. 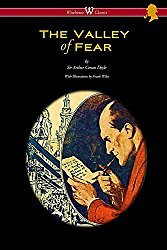 Doyle produced another novel about him -- The Valley of Fear -- and three more collections of short stories -- The Return of Sherlock Holmes, His Last Bow, and The Casebook of Sherlock Holmes. This final collection was published in book form in 1927, just three years before Doyle died. Holmes was different from the myriads of detectives written about by others. We are privileged to see aspects of his life from before he met his biographer (Dr. John H. Watson) until after his retirement. Holmes first discovered his great talent for observation and deduction while still a student. No, that's not quite accurate -- he always knew he had that talent, but he thought that everyone had it. Not so! Holmes was to discover the profound impact he was to make on others in "The Gloria Scott," an adventure he told Watson about his first realization that his unique talent was anything but commonplace. Another early adventure Holmes related to Dr. Watson was "The Musgrave Ritual." Years later, Holmes retired to Sussex to keep bees and study philosophy. This we know from "His Last Bow," which describes how Holmes comes out of retirement in 1914. He and Watson reunite to confound enemy agents. 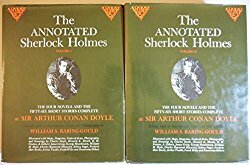 Since the time of Baring-Gould's indispensable two-volume set, Sherlockian scholarship has continued. Leslie Klinger has picked up the torch and has diligently sifted through the several decades of scholarship that was nonexistent when Baring-Gould was writing. 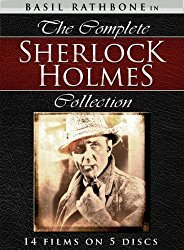 Mr. Klinger has produced an entirely new set of books with a similar title: The New Annotated Sherlock Holmes (Novels) and The New Annotated Sherlock Holmes (Stories). 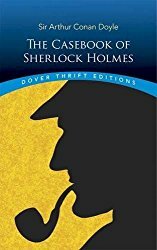 This is not simply an updated version of Baring-Gould's work; it is a worthy addition to the volumes of scholarship Sherlockians have produced and should find its place on the bookshelves of all serious students of Sherlockiana. 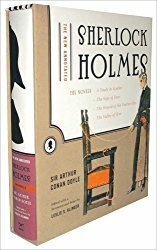 How Did Doyle Maintain Such High Standards in His Writing About Sherlock Holmes? The Sherlock Holmes stories continue to be held in such high regard world-wide that one wonders how Doyle was able to do it. Certainly he must have re-used certain plot elements and/or devices. What did he keep in his "bag of tricks," to pull out and use as needed? And how was he able to misdirect us so we overlooked his sleight of hand tactics? "For a Moment I Thought You Had Done Something Clever" begins to explore this theme. To explore it further, see" 'The Speckled Band' and 'The Copper Beeches': A Brief Comparison." 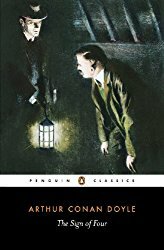 "The Adventure of the Cornish Boatman" probes the speculation by some that the later Sherlock Holmes stories were inferior to the earlier stories. And if you ever find yourself in Odessa, Ukraine, you owe it to yourself to visit the wonderful people at Cafe Sherlock. So welcome to the web page "where it is always 1895" (apologies to Vincent Starrett! ).